professional driving assessors trained and certified by DriveABLE™ administer the evaluation. ODEC instructors are trained to identify high risk drivers and provide rehabilitation training for medically at-risk drivers. 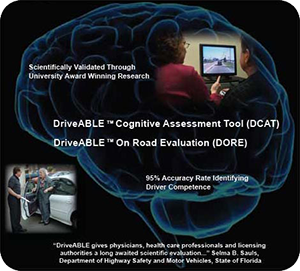 DriveABLE™'s science protects those drivers who remain competent to drive from being falsely identified. DriveABLE™ is an unbiased and objective evaluation. The assessment provides the answer for the sensitive and difficult driving issue facing many families. Even when no single condition is severe, several conditions can combine to make the person unsafe to drive. Medical conditions and medications can cause even the safest driver to become unsafe. Any medical condition or medication that affects mental ability can affect driving.